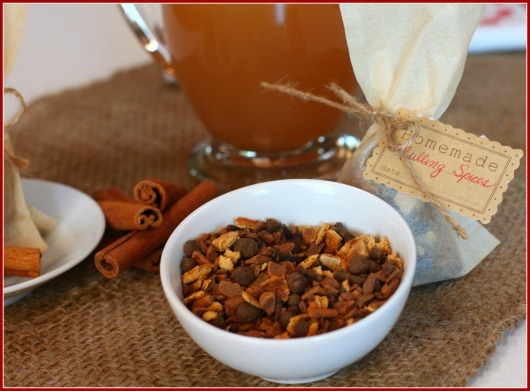 How to Make Your Own Mulling Spices & Get Your Kids to Love Apple Cider Vinegar! Okay. I know most of you already get that I have an obsession with Apple Cider Vinegar and all of it’s health benefits that go along with it. I also know that many of you have started to hail all of the Health Benefits of Apple Cider Vinegar as well as you have started to find ways to incorporate into your diets. I know this because I get a lot of emails from you all proclaiming your love of it. BUT…I also get a lot of requests as to how to get your kids to sing these praises too…or really, just even drink the stuff. I have a trick for you today. I swear it works every time. If it doesn’t work for you….well, then I promise I will owe you big time and will do something really really nice for you. So, here is my magic secret. It is a big one. And now that it is almost winter, it makes waaaay too much sense. Are ya ready? 1. Warm up some Apple Cider (or Apple Juice) in a small saucepan on the stove top (preferably unfiltered and organic). 2. Add some mulling spices wrapped in some cheesecloth, or a teabag, or a teaball. I have my simple recipe to make your own Mulling Spices listed below. 3. Let the Cider Mingle with those Mulling Spices for a bit on a low simmer. 4. Ladle into child’s favorite mug and let sit to cool for about 5-10 minutes. 5. When certain that your child is not looking, add a splash of about 1/2 teaspoon of Apple Cider Vinegar to the mug. Stir. 6. Deliver your special treat to your child. The Apple Cider Vinegar should not be detectable in that Mulled Cider. And they should happily sip their cider away…along with all of those health benefits of the Apple Cider Vinegar too. Okay. Maybe this secret is not all that big. And maybe your kids do not even like Warm Spiced Apple Cider. And maybe you are thinking this is a really silly idea. But, if you think it is worth a try, then give the above steps a go. 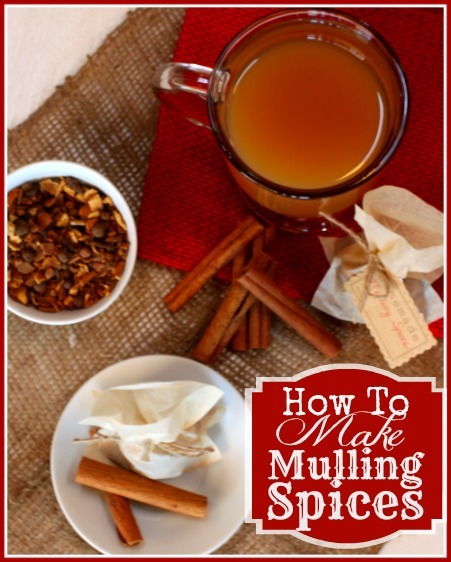 And better yet, see below on how to make your own mulling spices. It is SO SO easy to make your own. And… if you make them in cute little spice bags and wrap them with a fun ribbon, you can even give them as a thoughtful homemade holiday gift as well! 1. Place cinnamon sticks on cutting board. Using the bottom of heavy pan or a mallet, hit sticks to break up into smaller pieces. Place pieces in small bowl. 2. Mix remaining ingredients with cinnamon pieces. Divide mixture between 4 teabags (or cheesecloth). Tie each with twine. 3. 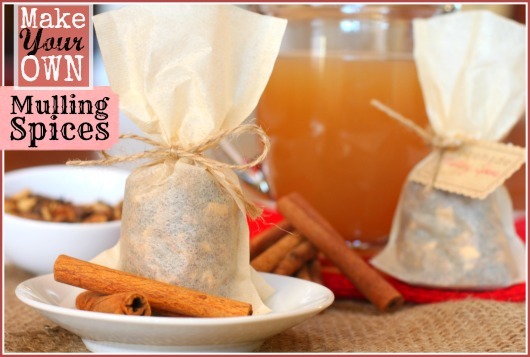 Use one spice bag per 1 gallon of simmering Apple Cider, Apple Juice, or Cranberry Juice. Can simmer for as little as 15 minutes or as long as all afternoon. Keep for yourself or use as holiday gifts. Definitely trying this Kim! I’m not sure they’ll love the mulled spices part, do you think it would still work with just apple cider? You are always so clever!! I bet a lot of adults will be trying this trick on themselves, too. 😉 I especially love sipping a hot ACV concoction when I am not feeling well. (And I gargle with another warm ACV concoction.) It really, really helps! I’m having people over for pumpkin carving on Sunday and I’m serving apple cider! I’m totally doing this! They are all getting a healthy dose of apple cider vinegar! Shhh, don’t tell them! Seriously, Kim, this is perfect. Thanks for sharing the sneak! Ooh. Good idea, Sarena. Give everyone a healthy dose of ACV. LOL And how fun!! We LOVE pumpkin carving parties. We go to one every year. ;D Have a great time!! Yum, I can smell it already! Nothing like mulling spices to make your home so much homier! And festive. Well, Max didn’t fall for it, but Sam and sure are digging it. Yummy! But we like the taste of ACV anyway. And it does make the house smell great. LOL! How I miss you my friend… Hope all is well with you and the family… And you will convince Max to love ACV yet!